Welcome to our homepage on the World Wide Web! We're glad you stopped by. You'll find lots of facts about our company and what we have to offer. We've also included links to some of our favorite Web sites. Feel free to browse around, and enjoy your visit! We are a clean, green power producing facility specializing in the development and operation of wind power plants. Incorporated in 1984, we own and operate more than 350 wind generators. 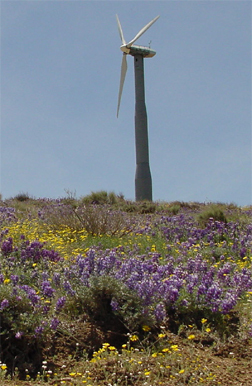 Currently, we produce and sell over 40 GWHs of wind generated electricity annually from our Tehachapi power plants. Kermit the Frog was known for saying that it is not easy being green. What is true for frogs may not be true for electric utility companies. California was the first state to open up the electric supply business to free competition. On March 31, that state allowed consumers to decide for themselves which utility company they wanted to do business with. A far cry from the traditional monopoly system still enjoyed by the vast majority of utility suppliers throughout the United States. CalWind Resources salutes the people of California for choosing clean energy to power their world in the new millennium. By choosing to buy electricity that comes from clean sources like wind, you have assured that more clean energy will be produced, directly displacing generation from polluting sources. At CalWind we've been providing Californians with clean energy for 16 years by turning the power of the wind into wind energy.